When I first started hearing about people getting a mattress delivered to their door in a compact box I thought it was all kind of strange. So I decided to do a little investigating myself into this new trend. I mean I'm all about trying stuff out for myself so why not. Upon further investigation I found that what they were getting was a mattress that had basically been vacuumed down and shrink wrapped. Kind of like how I store my clothing each season under my bed in those vacuum bags. Kind of cool if you ask me that they were able to do that on a much larger scale to make mattress delivery a lot more convenient. 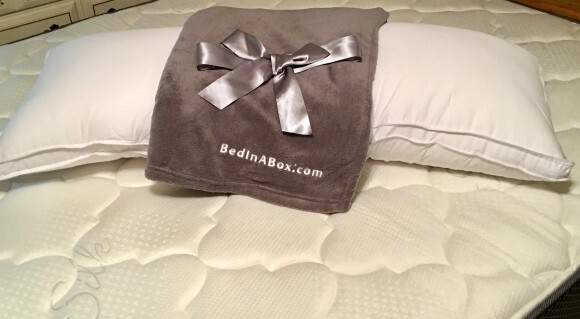 One of the places I came across during my search was BedinABox.com. 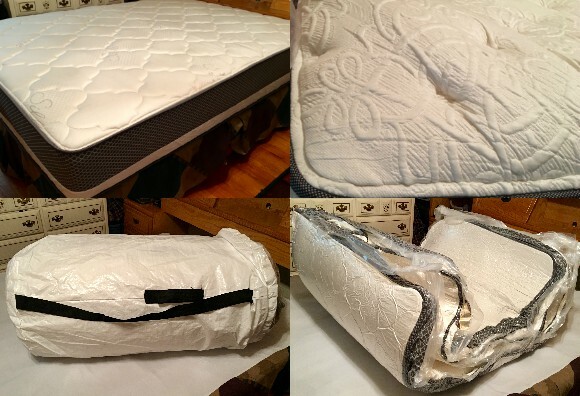 They have a wide selection of mattress styles and excellent customer reviews. My husband is not a fan of memory foam mattresses after having attempted to sleep on one awhile back in a nice hotel. He actually slept on the sleeper sofa because the thought it was so uncomfortable. However he was willing to give one from BedinABox.com a shot since they had so many choices to offer for firmness. We ended up going with their Silk Symphony bed because it was a flip mattress that offered both a medium and extra firm side. From the photo you can't exactly tell which side is which but in this one we have the extra firm side up. I thought if I was going to win over my husband with this bed that would be the way to start. We tried it out for a few nights and honestly neither of us could get a good nights rest on it. It was so firm that you always felt like you were going to fall off the side of the bed. Heck my daughter actually did roll out of the bed when she slept with me one night while my husband was at work. After that we decided it was time to give the other side a shot. Oh man was I glad we did. I loved it, and honestly it was the best I had slept in I don't know how long. I was finally able to be comfortable, and sleep the entire night without waking up at all. For me the mattress was a dream come true. Cyber Monday Sale Today Only - $100 Off Serenity Mattress Bundle + NEW Reversatemp Protector + Free Pillows + 20% off bedding + more.